Ferrari Formula 1 driver Kimi Raikkonen will make his World Rally Championship debut when he contests his home round of the series, Rally Finland, next month. Raikkonen has already competed in three rallies this year, but the Jyvaskyla-based ninth round of the WRC will be his first competitive outing on gravel. The Finn, who won the F1 world championship with Ferrari in 2007, tested the Abarth Grande Punto for two days in central Finland earlier this week. Raikkonen will be co-driven by Kaj Lindstrom, the former co-driver of four-time world champion Tommi Makinen. Makinen's own racing team will run the Abarth for Raikkonen. Lindstrom has contested Rally Finland 10 times, finishing sixth twice with Makinen, and admits the 29-year-old Raikkonen will face a difficult task when he starts his first WRC round. "Rally Finland is not going to be easy for sure," said Lindstrom. "The rallies we have done so far have been smaller events, a three-day WRC round is much longer and more intense than those national events. "And it doesn't just start with the rally, we have two days to go through the recce and make the notes. Kimi makes very good pace notes, but there will be pressure on for the recce." Lindstrom added that his driver's absence of gravel experience will also make his task tougher next month. "He has competed on snow and asphalt, but never gravel, but we have tested on gravel," said Lindstrom. 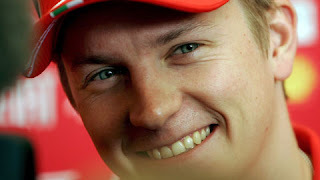 "But one of the hardest things for Kimi will be the speed of this event. Rally Finland and the roads used are so fast, like nothing we have done before - that does take time. "But, let's not forget, this guy is a pretty good driver! He's very talented and I'm sure he will cope fine." Raikkonen finished 13th in the Arctic Rally in January, his rally debut. He returned to snow rallying and held seventh overall in the Vaakuna Rally, before putting the Abarth off the road and ending the event 17th. His asphalt debut came on the Rally della Marca in Italy in May, where he damaged a wheel and retired on the third stage. Tommi Makinen's former co-driver Kaj Lindstrom has switched to the seat alongside Kimi Raikkonen in the Ferrari star's Abarth Grande Punto. A 10-time veteran of Rally Finland, Lindstrom talks to AUTOSPORT about his 11th outing on his home round of the World Rally Championship. Q. Where do you think you'll finish with Kimi Raikkonen on the next round of the World Rally Championship? Kaj Lindstrom: We're not worried about the position. I have to remember, like you in the media have to remember that this is only his fourth ever rally - he's really junior in this part of the sport. Kimi is going to enjoy himself. Q. What's the aim for the event? KJ: We want to have three clean days with no problems, that's the only target we have set for ourselves. Q. How much has he driven on gravel? KJ: Not very much, we're testing for the first time today. Q. How much of a test will he have? KJ: We're doing a day and a half right now and then we'll do another two days closer to the event. The test is close to Jyvaskyla [the rally base] so it's going to be on roads similar to the event. Q. What's going to be the biggest challenge for him? KJ: I think the recce will be quite tough. Kimi's good at getting his notes down, but there are a lot of stages and a lot of kilometers to get through in two days; they're very long days. It's going to be busy and there's quite a lot of pressure in those two days. KJ: Probably the speed. These roads are so, so fast and we haven't done a high-speed rally before - and we all know what a high-speed rally Finland is. But then again, he's a very talented driver and we shouldn't forget that. Last spring it took control like a parasite without any warning and grew bigger than it's host in silence and with determination. All of a sudden success vanished, the colours disappeared and the world became black and white. Kimi Räikkönen is for the big audience nothing but a grey shadow of the masterful driver he once was. But somewhere the real Kimi is still breathing. What supernatular power melted the Iceman. 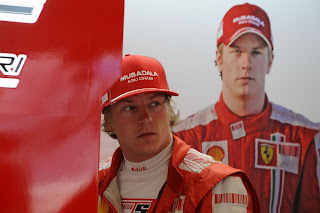 And who is that man who reminds us of Kimi but isn't Kimi? Kimi has raced exactly 40 races for Ferrari. Even though he wasn't after his victory in Melbourne exactly what Luca thought he'd ordered, the flaws where more or less harmless colour flaws. 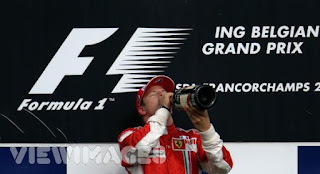 After a frozen spring Kimi put his act together and did what nobody expected - became a world champion. And just as the championship war in 2009 looked like it had surrendered under Kimi's power, the cannons exploded on his own face and half of the world turned dark. Something should be done, Kimi! There are two kinds of champions in sport. Those who never get enough and those who lose something irreplacable when achieving their dream so that they can't reach that same glory again. Blossomed once beautifully but shrank in a couple of nights. Even the sportsman himself isn't necessarily aware of the change. Usually only results tell that and often with a delay. 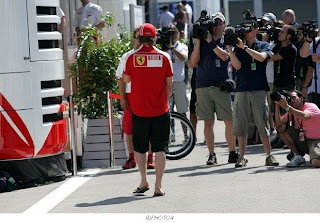 It's no wonder that the Italian media asks today if Kimi is more interested in rally than in his work. The signals he sends are conflicting; on one hand he emits fighting spirit with a monkey's rage but the next moment he looks totally indifferent to his own setbacks. It's not a bigger miracle that the circle of doubters grows bigger every week. Kimi feeds them himself with his own behaviour. In Spa last September - and instead of the end result it at least showed an attitude of 'everything or nothing'. Just what Monty needs so badly. Just what the whole F1-world needs. Kimi has had to prove something all his life. First to his parents that his hobby is worth sacrificing the small money they had. Later in karting-tracks from weekend to weekend and a lot later - in 2001 - to the doubting F1-world that he is ready to race with the most respected drivers in spite of his lack of experience. And next stepping into the boots of the double champion Mika Häkkinen in McLaren. When stepping into the driving boots of the Red Messiah, Michael Schumacher, he had to prove his talent and ability. He has always succeeded - and will succeed again when he wants. Silencing every ignorant critic around him. Ferrari has dropped a firm hint that it will soon switch its focus on to the 2010 car, with its current F60 having failed to prove a match for the race-winning Brawn and Red Bull Racing cars. With Felipe Massa and Kimi Raikkonen having scored just one podium finish so far this year, the team has little chance of turning its fortunes around in time to battle for the title. And that is why Ferrari president Luca di Montezemolo has suggested that the team will soon start shifting its efforts on to making sure that it gets its 2010 car spot on. "I am confident we can improve our performance in the next races, but having said that it is quite difficult if not impossible really to dramatically change the car during the season without tests," di Montezemolo told the official Ferrari website. The booze-steaming headlines about Kimi can be forgotten for some time at least. Kimi's strict policy when it comes to alcohol has held even during the hot summer. Räikkönen has completely dropped the quzzle with alcohol in the national Finnish way during his freetime. 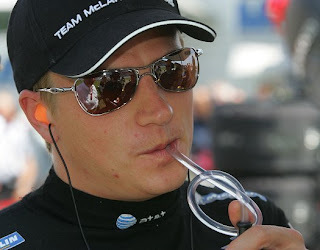 Kimi Räikkönen is a man whose doings in Finland are followed closely with a magnifying glass. Therefore the man's decision a while ago to stop drinking created a small storm in a water glass. 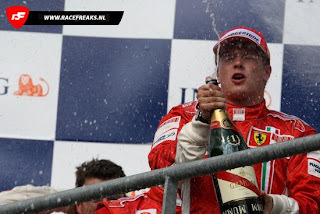 Kimi closed the cork in winter during the training season and according to the wildest rumours he had even made a bet with his friends. The steering wheel master's strict policy towards alcohol has held during the whole spring and beginning of the summer. - Kimi has taken a glass or two of wine with good food but otherwise there hasn't been any guzzle with alcohol, Riku Kuvaja told MTV3. Kuvaja was wondering about the sensation this all created already in February. – This kind of writing is already weird, the man said. Because of the KERS-experimentation all drivers' weights are followed more closely than ever but Kuvaja says that behind Kimi's decision there's no thoughts about losing weight or anything else special. - Do they always need a reason for these, the man wonders. Spa-Francorchamps, Belgium - Kimi Raikkonen kept alive his hopes of winning the Formula One championship by leading a Ferrari 1-2 ahead of Felipe Massa at the Belgian Grand Prix Sunday. 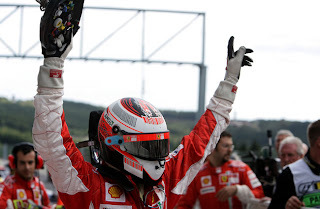 Ferrari led from pole for his 13th Grand Prix victory and his third in a row at the Spa track, the longest in F1. It was the third Ferrari one-two of the season as the Italian team dominated, leaving the McLarens of Fernando Alonso and Lewis Hamilton to make do with third and fourth places. Two-time world champion Alonso cuts Hamilton's overall lead in the championship to two points with three races remaining. Raikkonen is 13 points behind, but with a maximum of 30 points available, the title is still up for grabs. Ferrari's win was expected on a circuit which suits its aerodynamics, and Raikkonen and Massa had little trouble reversing the McLaren one-two victory in Monza last week. With Japan, China and Brazil the final stops in the championship, Hamilton has 97 points, Alonso of Spain 95, Raikkonen of Finland 84 and Massa of Brazil 77. BMW's Nick Heidfeld of Germany was fifth, fellow German Nico Rosberg in a Williams finished sixth, with Mark Webber of Australia in a Red Bull seventh and Heikki Kovalainen of Finland in a Renault eighth. After the FIA hearing on Thursday which led to McLaren losing its constructors' points, the action on the track at Spa was anything but spectacular. The top four on the grid led a procession after Hamilton was shoved aside by Alonso in an attempt to get past the Spaniard on the first bend. Hamilton was forced to run wide of the track as Alonso drifted left, and the two team-mates came close to crashing. 'I was confident going into the bend. I was on the inside and was able to keep my position,' he said. McLaren team boss Ron Dennis said it was a fair challenge. 'They are racing drivers, but they weren't being overly aggressive, no problem,' he said. '(We've had) 100 per cent reliability so far which is pretty remarkable. It was a bit of a boring race but we have to make sure we make no mistakes before these last three races. Alonso had little trouble keeping Hamilton at a distance after the initial challenge in which the tyres of the two McLarens came close to touching, but there was no catching the dominant Ferraris. Raikkonen took the chequered flag 4.695 seconds ahead of Massa, with Alonso a further 14.343 seconds back and Hamilton 23.615 seconds adrift. 'The car was very good. Everything went well and it was a nice race. It was perfect for the team,' Raikkonen said. Kimi Raikkonen admits Ferrari's fourth place in the Constructors' Championship is a true reflection of their "current value". The Scuderia have had a troubled season so far and have accumulated only 26 points, which leaves them 79 points behind pacesetters Brawn GP after eight races. Raikkonen, who has only 10 points and one podium to his name, admits the top three of Brawn and Red Bull are well clear of Ferrari at the moment. "We are in position four in the Constructors' Championship and I think that this is our current value," he told the Ferrari website. "We're out there fighting for third position, but the two teams on the top are still ahead of us in terms of performance." Although the 2007 World Champion was glad to be among the points at Silverstone, he concedes eighth place is not good enough for the Italian outfit. "Starting from the fifth row my goal was to gain some points," he said. "This time I had a good start: the main straight is quite long, but it wasn't enough to pass Nakajima. I came on the grass and then I was on fifth position, impossible to gain more, because my first stint was too short. "I couldn't overtake: in the fast corners at Silverstone it's very difficult to stay behind the car in front of you, especially when you have less fuel on board than the first ten cars on the grid. So I had a difficult race. In the end I gained one point. Better than nothing, but still a poor result." We had some pretty interesting improvements on the F60 at Silverstone, such as an improved front suspension and a new front wing. On such a fast track it was important to understand how much downforce we could have: we can say for sure that the car wasn't bad in terms of the set up, but we're still missing downforce to be able to compete with the leaders. Having said that, the developments go in the right direction. The qualifying seemed very promising. I was very happy with my lap in Q2, but then, when I had refueled the car didn't go as good anymore. Starting from the fifth row my goal was to gain some points. This time I had a good start: the main straight is quite long, but it wasn't enough to pass Nakajima. I came on the grass and then I was on fifth position, impossible to gain more, because my first stint was too short. I couldn't overtake: in the fast corners at Silverstone it's very difficult to stay behind the car in front of you, especially when you have less fuel on board than the first ten cars on the grid. So I had a difficult race. In the end I gained one point. Better than nothing, but still a poor result. We are on position four in the Constructors' Championship and I think that this is our current value. We're out there fighting for third position, but the two teams on the top are still ahead of us in terms of performance. After Silverstone we have two whole weeks to get ready as good as possible for the last two races before the summer break. The first of these two races is at the Nuerburgring. We'll get there with some improvements. It's a track with more slow corners and more braking points than the English circuit. We have to be more competitive, but it will also depend from the improvements the others can make. As usual. I want to congratulate Sebastian for his great race. If the Brawns had some problems we could benefit: the next circuit is very different from Silverstone. We'll see how things go before we make any conclusions. 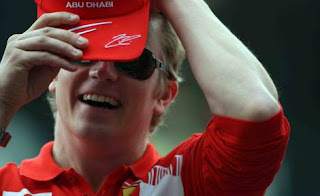 Former world champion Kimi Raikkonen on Friday blamed the dramatic schism and fallout in Formula One on warring egos. 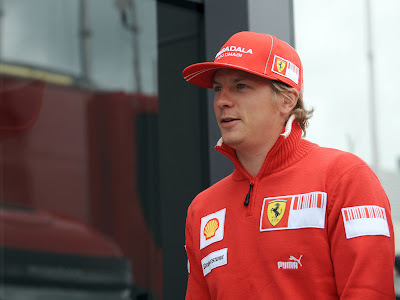 The 29-year-old Finn, who won the world title in 2007, said that he believed that the Formula One Teams Organisation (FOTA) and the ruling body the International Motoring Federation (FIA) had lost sight of the real issues. Ferrari ace Raikkonen said: "This is nothing to do with sport anymore, it's more politics and more about egos fighting against each other. "It's not really about Formula One anymore. It's about who is going to win and who is going to lose. It's sad, but that's how it is, and we'll just see what happens." Without mentioning names, Raikkonen appeared to support the belief that the split in the sport boiled down to a direct power struggle between FIA president Max Mosley and several individual teams and team chiefs. In essence, it came down to a simple question: who owns and runs this sport? Mosley, once a team owner himself with March, has worked for decades in tandem with another former team owner Bernie Ecclestone, once of Brabham, to exercise total control over Formula One?s rules, structure, commercial activity and calendar. Now that many of the teams are owned by major automotive manufacturers such as Mercedes, BMW, Toyota and Renault, the once-acceptable dictatorial style of management offered by the FIA has been rejected. The teams want to have rights of their own and run their own sports-business, in much the same way as several other major sports have seen the creation of elite competitions for the elite competitors. 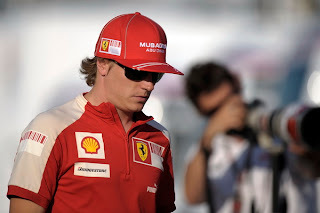 Raikkonen added: "Of course it's sad to see. I don't know what will happen or where we are going to race, but let's finish this year then we will know more about next year." The Finn confirmed that he, like Fernando Alonso of Renault, and most other top drivers, would follow his team out of Formula One in order to continue racing at the top level against the best teams and drivers. "For sure we want to have the best drivers and the best teams in the same championship. That's really what Formula One is all about. For sure, next year we are going to race somewhere, but I don't know where." Kimi Raikkonen says he did the best possible job in qualifying for the British Grand Prix, as his Ferrari team struggled to make an impression. The former world champion qualified in ninth place, while team-mate Felipe Massa finished down in 11th. Raikkonen believes he actually put on a good performance, but said his car was simple not fast enough. "I didn't have much expectations, I didn't know exactly where we are, so overall I think we did as good a job as we could in the qualifying," said Raikkonen. "Unfortunately the car is more or less where we are now. We did nothing wrong, we couldn't really go much faster." The Finn reckons his team has continued to improve in the last few races, but he feels its rivals have taken bigger steps forward. "We try to do the best that we can in every race. For sure is more fun to fight for first place but that's not happening right now. We are where we are and still pushing forward and trying to improve all the time. "Sometimes the races can be exciting when you are fighting in the middle of the field, but for sure we would prefer to be in front. "We have improved the time all the times, but the other teams have improved it even more. We are improving all the time but other people do not stop improving." Raikkonen also claimed he did not believe he had distracted Red Bull Mark Webber, after the Australian was critical of the Finn for being in the racing line during his final flying lap. "I tried to lose to the side as much as I could, so I don't think he lost any time," Raikkonen said. There’s always lots of wind at Silverstone and it often rains, even in the summer. The track conditions are changing extremely quickly so that it’s difficult to find the right set up for the car. Usually, when you’re leading in the Championship, you hope for stable weather conditions, but this year it’s different and we try to consider this variable part of the fun of racing in England. For the first time we’re racing at Silverstone without any prior test sessions. The Team prepared some new solutions, which we will test on Friday morning: as never before this year it’s fundamental to exploit the three free practice sessions as much as possible. At Silverstone the performance in the fast corners is very important, where you need a high aero downforce. We hope that the new solutions will help us to improve in an area, which brought us into difficulties in Turkey. As I’ve said several times before we need to be patient: we’re improving thanks to the hard development work, but we’re still not able to fight for a win against the Brawns. I’m extremely confident and I’m convinced that after another couple of races we’ll have closed the gap between the leaders and us. I know that this is what our fans want from us and we’re giving it our all to succeed. It will be a difficult British GP: a place on the podium would be a great result. Form me this is really significant track. This was almost the starting point of my international career in the minor Formula series and I always loved to race here. That’s why it’s a bit sad that this should be the last edition of the race, but I have to admit that I also really like Donington: I’ve won there too already…. Kimi Raikkonen has no regrets over his win-or-bust gamble at the Nurburgring and goes into this weekend’s Canadian Grand Prix in Montreal with his world championship ambition burning as bright as ever. The Finn was all set to close on world championship pacesetter Fernando Alonso when he entered the last lap of the European Grand Prix two weeks ago in the lead. But he ended the race a further 10 points down after a suspension failure pitched him out of the race. Vibrations from a damaged tyre caused the accident but McLaren opted to keep Raikkonen on track and in the hunt for victory, rather than make an extra pit stop and claim a safe third place. Despite leaving Germany with no points from another dominant weekend, Raikkonen is adamant McLaren did the right thing and insists he still has a real chance to claim the title, despite trailing Alonso by 32 points. Raikkonen, who caused the problem by locking up while lapping a back-marker, said: “In the end we needed to gain more points than Alonso and he was behind me. “I didn’t see any reason to come in when we were in a position to take two points more than him. “We took the gamble and it didn’t pay off but I would still do the same thing again. On his championship chances, Raikkonen added: “We got some points back [with wins in Spain and Monaco] but it’s not easy to gain much back because they keep finishing races. “There are many races to go so anything can happen. As long as we keep finishing races ahead of him there is still a chance. Raikkonen is convinced his McLaren is still the car to beat this weekend in Montreal. The Finn has been the fastest man on track for the last four races, with engine and tyre problems respectively denying him certain victory in San Marino and Nurburgring, and he believes that advantage will continue in Canada this weekend. “We had a very good test last week,” he said. “The car is quick, better than it was in the last race. I am pretty hopeful the car will be good here. “For sure the car will be good in the United States because every car we have made has been good there. “Here is more of a question mark but I don’t see why we shouldn’t be competitive here. “I think Renault are a very reliable package but we have at least as good car as they have, we can fight against them. Rain is predicted over the weekend in Montreal but Raikkonen is confident even the Canadian weather cannot derail his bid for a third win of the season. McLaren’s Michelin tyres have struggled in wet weather but Raikkonen helped test new designs recently and, even though he concedes Bridgestone still possess a slight advantage, he is not concerned at reports of thunderstorms throughout the three-day weekend. He added: “I think the intermediate tyres are pretty good. “We have had some opportunities to use them and they seem as quick as the Bridgestone. “I think the full wets are not on the same level but they are improving all the time – it depends how much water is on the circuit. Sauber set to sell Räikkönen? Switzerland's Sauber motor racing team are reportedly on the brink of selling young Finnish driver Kimi Räikkönen to Formula One giants McLaren-Mercedes. According to Germany’s ‘Bild’ newspaper, McLaren are hoping to unveil Räikkönen as their new driver at this weekend’s Italian Grand Prix in Monza, where the team’s current driver Mika Häkkinen is expected to announce his retirement from the sport. 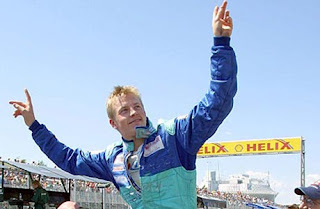 However, Mclaren on Thursday dismissed as speculation the report that Hakkinen was set to announce his retirement. The company added that a decision concerning the driver's future was expected before Sunday. 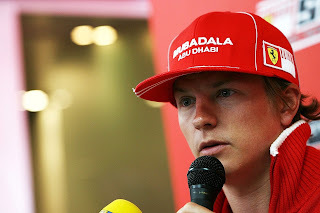 Peter Sauber, the head of the Swiss team, has already confirmed that McLaren have expressed an interest in the 22-year-old Räikkönen. In previous interviews, though, Sauber said he hoped negotiations would not interfere with the team’s preparations for the last three races of the season. Sauber added that his Hinwil-based outfit wanted to concentrate fully on their bid to hold on to fourth place in the constructors’ championship, but that the discussions over Räikkönen were distracting the team. Sauber has also been keen to remind people that he is capable of blocking any move by Räikkönen, who is currently under contract to Sauber until 2003. However it is now widely believed that the Swiss team will release the young Finn from his contract in return for a sizeable compensation fee from McLaren. The ‘Bild’ on Thursday suggested that the deal could cost the British-based team SFr 25-40 million ($15-24 million). 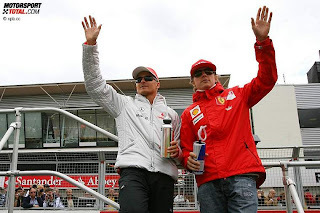 If a deal is done, the early termination of Räikkönen's contract is likely to come as a personal blow to Peter Sauber who fought hard to get the driver his Formula One licence when many in the sport were arguing that the Finn lacked the necessary experience. Sauber are currently experiencing their best ever season on the Formula One circuit, with Räikkönen and his fellow driver Nick Heidfeld having already accumulated 20 points. That tally has put the team in fourth place, behind the giants of Ferrari, McLaren and Williams, and four points ahead of their nearest comparable rivals BAR and Jordan. Le Mans 24-hour run on Saturday, the sender acted Ferrari CEO Luca di Montezemolo considers that it is possible that Ferrari could soon take part in the legendary tallina competition. Italian La Stampa newspaper interview Montezemolo was inspired to look at the Ferrari driver possible choices. - Kimi Räikkönen and Felipe Massa would certainly be a good job. Then, of course, the test driver Marc Gené. I would welcome a few old familiar: Jean Alesin and Michael Schumacher, Montezemolo outlined. Ferrari has announced that it Mansia Le plan if the team does not participate in the Formula ones-MM-series next season the rule because of the dispute. - We are here to survey cars, and rules of the future, Montezemolo said. Montezemolo called for re-strict tone of the international auto union to back the rule dispute. - The FIA has to understand that now is the time to solve problems, not create more of them. A couple of years, the situation is resolved one way or another: either in one FIA, or the new World Series format. We are not interested in any F3 series. We want stability in the rules and not "gray area": if this year we, the McLaren and Renault, we have not been able to interpret the rules correctly, it means either that the rules were not clear or the fact that we are all messed up let - and we do not exist, Montezemolo said a recent diffuusorijupakkaan referring to. Ferrari president Luca di Montezemolo remains convinced that the "very grey" regulations relating to diffuser designs was the root cause of why former champions like his team, McLaren and Renault have all struggled this year. "We now, after in the last 10 years winning eight titles in 10, now [Stefano] Domenicali and his group - together with some other teams - are at the moment not in the condition to win the championship," he said during a visit to Le Mans. "But sometimes it is important to be hungry, because if you eat too much then you don't know what it means to be hungry. So sometimes in life it is good to be hungry and then when you eat again, you understand how the food is important. So after 10 years it's important sometimes and we will see. "This happened because unfortunately we have been in front of very grey rules in which the interpretation of the rules was, how can I say, unpredictable. "It's quite amazing that the teams that have won the last three world championship titles in Formula 1 - Ferrari, McLaren and Renault - has done the same interpretation of the rules. "So it is one of two [reasons]: all of us became completely drunk, or the rules became not clear. I have the answer that this is not the case because we are not drunk, yet." Well, it was not the best weekends for us. The car with the new parts felt better in the practise. The qualifying was ok. But in the race I started on the dirty side of the track and then damaged my wing on the first lap. All in all the happenings of the first lap stopped me scoring any points this time at Instanbul Park. Obviously, we expected more from this weekend, but having said that, we also knew that it's not going to another Monaco for us. The team has worked really hard in the factory to get us closer to front runners, but we are still loosing out in the quick corners, that require high downforce. We seem to be very competitive in the slower corners. Every race we have new parts, so hopefully we close the gap at Silverstone next week. While you are not able to fight for the pole position, it's a question of luck, which position and which side at the grid you get form Q3. It's always better to be in cleaner side. Particularly Monaco and Instanbul Park belong to the circuits where the difference from the clean to the dirty side of the track is even more significant compared to many other places. On Sunday my start was difficult, again. I could not get it properly from the line and it was one of the circuits where the run to the first corner is too short to be able to use the KERS system. I lost one place after the start, then one place in the first corner, too. After that fighting for the position I touched the rear tyre of Fernando Alonso's car in turn 12 and I lost a piece of end plate from my front wing. Once that happened it affected the handling of my car. Some downforce dissapeared and that cost us time in high speed corners of that circuit. We changed the wing during my first pit stop, but then it was too late to do anything. Obviously we were not fast enough to fight with front runners. But it was unexpected that we lost some race pace to Williams and Toyota, too. I think it had more to do with the nature of this circuit and with the high temperature, too. Without the broken wing accident we could have easily taken 1-2 points. It's a shame to finish the race in P9, which is not giving anything to anybody. There is no reason to give up the fight. We just have to be patient and work hard. There is potential to get better results after we got everything nicely together with the package. I wish everything goes better in the next race at Silverstone. It's one of my favourite places. We share a long tradition together and another podium would be a good result from there. The Ferrari has always gone well at that circuit, so hopefully that continues this year, too. Kimi Raikkonen has insisted Ferrari still have the potential for strong results this season, despite a disappointing outing in last weekend’s Turkish Grand Prix. After strong progress in Barcelona and Monaco, the world champions came away from Istanbul with just three points. Raikkonen admitted the team were bettered on race pace by more rivals than they’d have liked, but believes that with the F60’s slow-corner performance much improved, the team now just have to keep up the hard work to make the car truly competitive. “The team is continuing with its hard work improving the car and closing the gap to the leaders: the situation is much better in slow corners, where we are really competitive, while we’re suffering in the fast ones,” he said. Oh well, Turkey wasn't the kind of place we expected it to be. We already said that we can't change the situation in a flash into something. You just have to be patient. We did well in Monao even though we didn't exactly have the best car but in Turkey we couldn't keep up with the lead in the same way. I guess it kind of came from behind the bushes, us losing the speed at the racing day. After the practice we still believed that we will be ahead of Williams and Toyota in the race rhythm but still we got *** No swearing ****d up by them on Sunday. There ain't much to tell about this guy's race. I almost didn't get going from the slippery side of the track in the start and lost immediately my place there. Then I went a bit wide in the 9th corner and when I tried to patch up things I hit Alonso's back tyre and lost a piece of my front wing. My downforce went weaker and it hurt in those fast curves on that track. The front wing was replaced during the first stop but it was already too late to try anything. I already lost the point positions during the first lap. The rest was just cosmetic. If you want to look for something good then we were fast in the slow places just like in Monaco. We just have to work more so that we would find speed into the fast places too. I arrived at the chequered flag in position 9. If I wouldn't have bumped I would have got a couple of points easily. Even though the result does not show it the car felt once again better. I just didn't get what I was looking for. We get new pieces to the next races too and the team is working their as*es off so that we could also get better results. My eyes are now focused on Silvestone. I have a long mutual history with that track. I've raced there a lot and it's always cool to go there again. Ferrari's car has usually been great there. Maranello - We definitely expected more from the Turkish GP and it doesn’t make any sense to hide it. We knew that the situation would be complicated compared to the previous race at Monaco, but after the good qualifying we didn’t think that the race would be so difficult. The start was decisive. At Istanbul, but also at Monaco, it makes it very difficult when you have to start from the dirty side of the track. And on both tracks the first corner is very close to the starting line, so we can’t even exploit the advantage of the KERS there. I lost a position when the lights went out and another one in the first corner. During the duel with Alonso I touched his wheel with my front wing and damaged it, loosing downforce. We changed the nose during the pit stop, but it was too late to improve. If that hadn’t happened maybe I would have gained a place in the points. We weren’t fast enough in the race, not only compared to the Brawn GPs and Red Bulls, but also compared to the Williams and Toyotas, also due to the high temperatures. The Team is continuing with its hard work improving the car and closing the gap to the leaders: the situation is much better in slow corners, where we are really competitive, while we’re suffering in the fast ones. We don’t have any reason to give up, we just need patience; that’s what I’ve said before the race at Istanbul. We do have the potential to achieve a good result, I know it. I hope that everything will work out at Silverstone, which is one of my preferred tracks. Ferrari has a good tradition in this race and it would be great to keep to that. Ferrari has gone fast in Turkey the last three times. This year Brawn GP has won five out of six races and they are favorites. But we will catch them. We just have to squeeze 100 % once again and then we're closer - or pass them. Getting into the top three in Monaco was a fair enough result. The team really works hard and their motivation only grew now that we got both cars into TOP-4. In Monaco we made the biggest progress when it comes to the results. It was what we needed from there. You just have to be patient. Me and my fans surely want just as much that Ferrari would start winning again. Monaco is so different compared to other tracks. Turkey is a totally new game. From there we will get a better picture of where we go and how our competitors have done their jobs. Turkey is a cool track. We drive counter-clockwise and if everything isn't in place there the neck will be screaming Hosianna. I dig the place. The curves are all different and we take some brakings completely blindfolded. It's always cool to take that track. In Monaco we were in the front row. In Turkey a good starting position demands that the downforce is at least the same as Brawn and Red Bull has. Aerodynamics are important for everyone but when the times are so close every detail in quali is crucial. From summer begins the middlepart of the season. I'm much more hopeful now when we have got so much positive progress made. This team knows it's thing. The development pieces have come really quickly and you can feel all the time that the car is better. And we aren't stopping here. Puttonen (Button - lol) is leading and he has everything bagged when you think of the championship. When you win 5 races out of 6 you are in a strong position. But it doesn't do you any damage if you try right until the end. When the chequered flag is out for the last time, that's when you count all the final points. I had fun on Saturday. We took the rally in Italy, my first on tarmac. It's always fun to drive and it was fun to spend some time with the fans too. Of course the race could have lasted longer. Now it ended in the middle but it happens sometimes. World Rally Championship global promoter Simon Long said he would be "extremely interested" in talking to Kimi Raikkonen about the Finn's future beyond F1, according to Autosport magazine. Raikkonen competed on his first asphalt rally last weekend, but crashed out of the event with a broken TCA on SS3, after suffering centre differential problems with the Punto from the start of the rally. Kimi states that he is interested in contesting more rallies this season, with another two outings pencilled in for the Tommi Makinen Racing prepared Abarth Grande Punto S2000. "Our sport is built on heroes and iconic figures - and they don't come any bigger than Kimi Raikkonen. Just the mention of his name has got my pulse racing. I'd be more than willing to talk to his people to help out in any way we can. We've seen the attraction WRC holds for Valentino Rossi, and I'm sure it would be the same for Raikkonen." 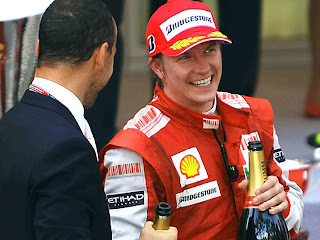 29-year-old Raikkonen is contracted to Ferrari until the end of 2010. 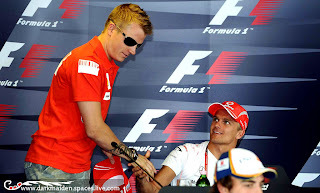 Kimi Räikkönen reminded on Thursday that we have seen many surprising turns in the F1 championship serie. Therefore Kimi isn't yet ready to declare Button as a champion in spite of his lead. How well do you believe the car fits Instanbul's Otodrom-track? Räikkönen: It's hard to say how our present car fits this circuit but Felipe Massa has won here 3 times and I have won once so our car has worked well here earlier. Hopefully this time too. We have a few new parts and we'll see how well they work tomorrow. Could one say that so far you have the best chances of winning the race? Räikkönen: In the last race in Monaco I had a chance if I would have managed to get the pole. So far we haven't yet driven here so it's hard to say if this is possibly the best place to win a race. We can be strong here but we'll find out later if it's enough. Still you have made progress all the time? Räikkönen: The car was already in Barcelona better than before and Monaco went well too so at least we have made progress when it comes to performance. Now the car has little by little started to be much closer to the top than it was in the beginning of the season. Does the car feel much different after all these changes than before? Räikkönen: It doesn't feel much different even though we have more downforce now. When we got the new floor to the car it made the biggest difference. Other than that it behaves pretty much like it behaved before but it has more traction so you can drive faster. In the beginning of the season the car felt good to drive but when there is no traction it's seen in the laptimes. So the only thing that has changed is that you can now take the corners with a much faster speed. How important is this race when thinking of the championship? Räikkönen: We have developed for the better all the time but we aren't stil on the level where we want to be. When it comes to the championship battle it's good to be realistic because we are much behind the lead in points. Which one is in your opinion in a better position when thinking about the championship, Brawn GP or Red Bull? Räikkönen: Brawn has very reliable cars and they would have to face quite big problems before the others would have a chance to catch them. It's very unlikely. On the other hand we saw really surprising turns in F1 last season so one should never stop trying. We at least do eveything in our power so that we would win races and that way put a little extra pressure on them. Of course we still have a chance but a very small one if we are realistic. Red Bull might have slightly better chances in catching Brawn. When you won the WDC in 2007 you came from behind, pretty far away from the lead. Do you still think that there would be hope for a similar rise? Räikkönen: Always when there is a mathematical possibility to win the championship, hope is alive. Or maybe you shouldn't talk about hope, rather that there is a small existing possibility. Of course you can also hope for the best result. The fact still is that we should win quite many races and they would have to fail and that doesn't sound realistic. Will you now drive more for the honor than for the championship? Räikkönen: It's natural for the team that we try to win as many races as possible and score as many points as possible. That is our goal number 1. How certain is it that you will drive in F1 next year? Räikkönen: Well, I think I will drive next year too. We have a contract and no matter how many different stories are told about other things, they are just stories. We'll see next year who drives in which team. Many assume that the next season is your last season in F1. Is it possible that you would negotiate for continuing after that? Räikkönen: Everything is always possible. As long as I enjoy this work and have a good place to work, it's always possible. I haven't yet decided anything and I don't even have to think about it yet. We'll see where F1 is going. Happened in September 2000: Peter Sauber called me in the office. - We are going to test a young Finn in Mugello, Sauber said. Then he started spelling out the driver's name: Ki-mi Räi-kkö-nen. I couldn't believe my ears. I had to ask Peter if he was trying to trick me. - I know that experience matters but one carpet salesman has described this Finn driver to be so sensational that I gave in, Peter said. Carpet salesman? Sauber really used to call managers who approached him trying to sell their protegés carpet salesmen. This time the carpet salesman was David Robertson. Even though Kimi had only driven 23 races with a formula car, Peter spread the red carpet in front of him. Why? - Because Michael Schumacher recommended me to make a contract with the Finn driver. Michael couldn't even spell Kimi's name but said that his laptimes are sensational, Sauber tells. 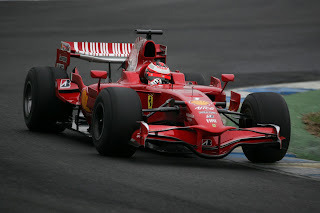 Schumacher had noticed Kimi's talent while driving behind him for several laps. But 3 months later Kimi still didn't have the super license you need for the F1-serie. FIA prepared to decide in Monaco whether they should grant the inexperienced Räikkönen the super license or not. Before the meeting Kimi's manager David Robertson called me a few times. He was very nervous and asked for my help. He wanted me to talk about Kimi's license in a positive tone to Bernie Ecclestone. This helped. Ecclestone, Jean Todt and Ron Dennis were all thinking that Räikkönen would deserve a super license. There wasn't many races driven in season 2001 when Ron Dennis promised to Kimi that he would make him a WDC with McLaren's car. After that it's understandable that Kimi had nothing else in mind than jumping fast into a top team. Dennis put constant pressure on Peter Sauber. - It wasn't nice. It really wasn't nice, Sauber says and doesn't want to talk more about the events that lead to Kimi moving over to McLaren. Kimi drove for McLaren for 5 years but didn't get the WDC Dennis had promised him. The young driver I had interviewed for the first time 8 years ago in a pizzeria changed during his McLaren-years into a more quiet, careful and doubting. Moving over to Ferrari did good to Kimi. - I've become like a new person in Ferrari. There we are one big family, Kimi said. 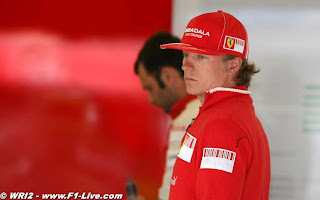 During last times we haven't heard that kind of praisal from Kimi's mouth very often. All of a sudden there has been pressure flooding in from every direction. He is standing in the crossfire of critics. He is in a bewitched circle from where you don't get out with only talent. This year Kimi needs a little luck, an excellent car and a very patient surrounding. If the WDC fails again the Spanish media will be overjoyed, especially the media who wants Alonso to Ferrari. 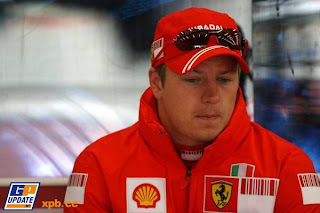 - Kimi is living in a different world on a different planet, Domenicali described his nature in Mugello. Maybe he is right. Maybe Kimi's home village isn't in this world on Zürich lake, maybe it's somewhere else. It might feel like that for Kimi. In a country like Switzerland the wildest stories of Kimi's marriage and adventures on his free time doesn't really interest anybody even if they were true. The Swiss media doesn't pay for hints or use paparazzi-photos. Maybe that's why Kimi can feel that living in Switzerland is like being a space man living on another planet. Kimi Räikkönen protects his true self image just as carefully as Batman protects his. Season 2008 was confusing. Kimi wasn't the same driver who during the previous season was almost the only one who still believed into the end that he had a chance of winning the WDC and who aggressively grabbed every opportunity as soon as it was flashed in front of his eyes. And he wasn't the same driver who hit his head against the wall for many years in McLaren with a non-competitive car but still made a crappy tractor drive wild laptimes purely with his will power. And not the same drive to whom every defeat was a small death. 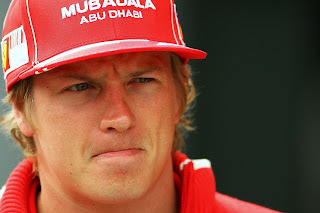 Very serious - assures both Kimi and his boss. They are whispering on Maranello's alleys and corridors that Kimi has once again withdrawn into the solitude of the night's darkness, strenghtened his threshold of pain and sharpened his weapons for a counterstrike. 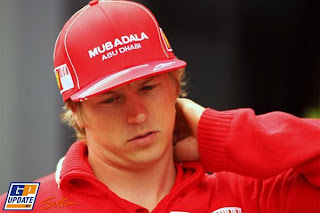 - Kimi is like the center forward in a football team who hasn't made a goal for a while. 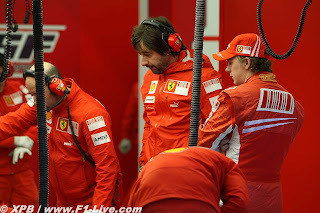 But when he starts succeeding again he will start delivering them one after another in a row, Luca di Montezemolo said. Kimi drives only for the victory. With his absolute nature you don't just hang around because F1 is fun. He would much rather have fun driving in the rally. Because Kimi was prepared to commit to Ferrari for at least two years he has to be ready to give all he has got. The rumours have supported that he is determined. 'So boys, it's racing time again' Kimi thinks behind his icy blue eyes. Playing is far away when the order will be restored on the restless streets. Ferrari-kuski Kimi Räikkönen on kasvattanut itselleen kunnon kiharat. 29-vuotiaan Kimin tukka on kasvanut talven ja kevään aikana jo kunnon mittoihin. Formulaässän vaaleat hiukset pilkottavat lippalakin alta jo niin pitkänä, että kohta Kimi saa kutrinsa jo pienelle ponnarille. Siitä, kuinka pitkät kutrit Kimillä on, ei ole selvyyttä, koska miehen lookkiin on kuulunut lippalakki kauan aikaa. Toivottavasti Kimi bongataan Turkin kisaviikonlopun aikana myös ilman lippistä. Turkin GP -lähetykset suorana MTV3 MAX -kanavalla. 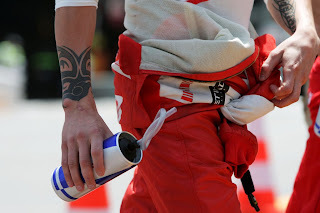 WOW, WHAT ANGEL LOCKS, KIMI! 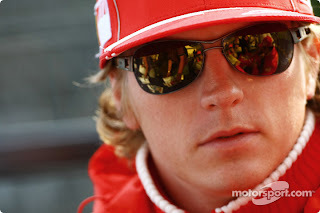 Ferrari-driver Kimi Räikkönen has grown himself real locks. 29-year old Kimi's hair has grown during the winter and spring into serious measures. The F1-ace's blond hair is peeking out under his cap already so long that soon Kimi will get his locks into a small pony tail. 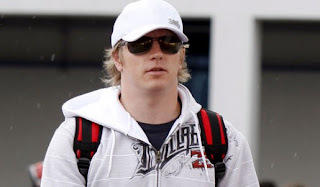 It isn't clear exactly how long Kimi's locks are because the cap has belonged to the man's look for a long time. 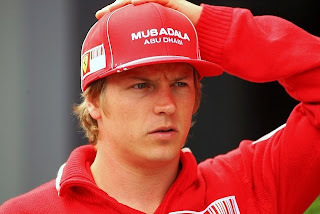 Hopefully Kimi will be spotted in Turkey without his cap too. I will never forget how I for the first time watched Kimi's driving on Snetterton track in Formula Ford. At first I didn't introduce myself to him at all because I wanted to watch how he took the corners. I didn't want him to know I was there. I discovered very quickly that Kimi had the ability to control the car in situations where other drivers would have gone off the track. Also the fact that he only needed a couple of laps to learn a new track was absolutely convincing. With a slightly better luck Kimi would be a 3 time WDC. Always when Kimi starts competing - whatever the sport - he has an unbeliavably strong will power to win. And his mental strength is also incredibly unique. 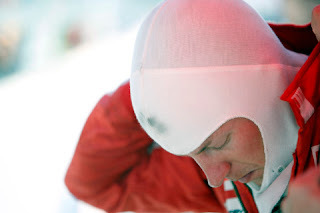 Kimi finished his condition for the championship in our sauna in year 2007. We have also been singing karaoke with Kimi in pubs in Tampere. I think he sings pretty well but I suspect that he is a better driver than a singer. Kimi is a very sympatic person and really not an ice pick like some beauty queen said. Kimi always takes his friends into consideration. I know that Kimi has been training well but I can't say how he is going to succeed. It's a new season, new rules and whoever gets comfortable with these new systems fastest will succeed. It could be that the championship is determined in the last races. Kimi is a supertalent when it comes to sport, especially in motoric ways. He always goes really eagerly into all sport things and everything is fine to him. I've played ice-hockey with Kimi a couple of times. He has a good eye for the game but you can clearly see that ice-hockey is his second sport. Kimi is extremely talented. I've sometimes been with him when he has driven a rally car. For example his ability to react is on an extreme level. And all those guys are physically in an awesome condition. 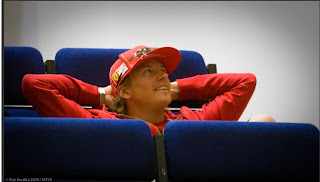 On his free time Kimi is relaxed and fair and he has a great sense of humour. All Finns are quiet. Mika Häkkinen was like that and so have all the rally drivers been too. Kimi is still an extreme case. On the other hand, when you go with him to a pub he suddenly talks a lot more. In GP's Kimi doesn't want to be disturbed. One disturbing factor is the media. Outside the track Kimi is much more relaxed. The driver's work is both mentally and physically really demanding so you have to relax once in a while. Someone does it by sleeping but a much better way is to have a good time. It has never disturbed Kimi's work. I remember that Ron Dennis really liked him. Kimi was very quick but he drove the car in a different style than I did. With his setups the car behaved completely differently. Outside the track we didn't speak much. He was always very quiet. We never had any fights. It isn't any secret that Kimi doesn't talk much. We worked together for 6 months before we had exchanged more than three words and those times we tested all the time so we spent much time together. 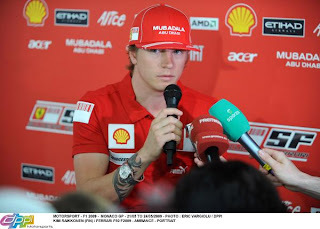 Then I started to talk about motocross and noticed that Kimi is very talkative when he feels comfortable. I've always thought that Kimi is straight, honest and has a very clean nature. He has often been misunderstood. We still have a good relationship. It can take 6 months that we don't speak but when we speak the jokes are flying and we are immediately on the same wave length. I've known Kimi since we were boys in karting. One thing that hasn't changed is that Kimi never speaks anything bad about other drivers and has never taken part in any politics. I believe that Kimi is in a good stitch when the season begins. I circulated races in Europe with Kimi when he was driving karting. I've seen many unbeliavable performances from him. Kimi is an incredible driver. 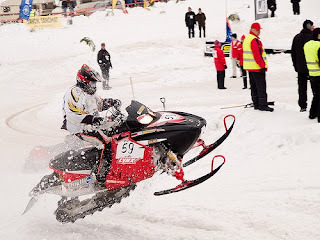 That guy goes fast with any machine - snow mobile, motocross bike, rally car like we've seen this winter. If he would drive a caterpillar he would drive millions with it. I believe in Kimi as in a mountain. He is champ favourite Number One. The first time I met Kimi was in Jyväskylä 2005. The next year we got to know each other better in Monte Carlo rally where Kimi was driving the front car for Jukka Jalonen. I've sat beside Kimi now in two rallys and I have to say that the speed has been incredible right from the start. From Kimi you can see that he wants to go forward all the time and develop himself as a rally driver also. He is very hard on himself and can be very critical when it comes to his own performances. We haven't decided the next rally but we have talked that it should be either on asphalt or on gravel. We might rally during the F1-season. I've known Kimi for a longer time. I'm a thai boxer but I have never taught Kimi my sport. 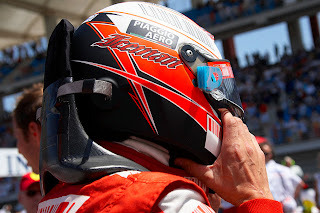 Kimi is calm and determined and doesn't take pressure on himself. He never bugs into other people's doings, instead he lets other people be in peace. It doesn't surprise me at all that Kimi has become a F1-WDC. Anyone who dresses himself up as a gorilla and takes part in a snow mobile race under the name James Hunt has to be a great guy! It's legendary. Without doubt Kimi feels most comfortable when he has his helmet on his head. When we started as team mates in Renault I said that he is the future WDC. He had already back then the icy look in his eyes and the kind of determination you need. We had some good fights. He pushed me a couple of times on the grass in Thruxton and i still haven't forgotten about it. Kimi is a splendid guy. I got invited to his wedding and I'm sure it came from his heart. If Kimi doesn't like something he shows it but still he isn't unfriendly. In the group of people that he likes and trusts he is a good guy. Kimi might seem cold but he is more interested in driving than in press conferences. I'm sure it shows in his behaviour from time to time. To tell you the truth the weekend in Monaco was better than we have had in a long time. But can't help it. It didn't quite fall into place there either. Because the only thing I want is to win, it was all the same if I came 2nd or 3rd. The prize jug means much more to the team than it means to me. Those guys work their a*ses off from morning to evening and it's a great thing when the results get better. We are getting new blocks for the next race and when the direction is right, like it is, we will take poles and win races sooner or later. It just takes a while before everything goes the way we want. The quali in Monaco was a hundred times more important than in any other place. I pretty much nailed it. I got lucky when the laptime came in the right time. For once it went this way. But since I didn't get on pole I lost already on Saturday. It seems to go everytime the same way when in the second square. I had to take harder rubbers because otherwise the softer ones would have turned into chew too fast. Barrichello had softer tyres and the cleaner side of the track. He went past me while I was spinning on place. *** No swearing *** it, it just went like this again. I got busted. I lost the victory in the quali and the 2nd place in the start. If I would have got after the leading car I could have tried harder. I just lost more and more behind Barrichello when he had some prob with his tyres. The rest of the race was just to keep my third place. It was good that both cars finished, we scored good points and I beat my team mate. From here it's good to continue like the saying goes. The car is better and will get only better the whole time. When we win with it we are where we want to be. I get cool feelings when the team gives me opportunities to drive rally. I go this weekend to Italy and get to try for the first time how the Fiat Punto goes on tarmac. Let's see how the tarmac man hits the tarmac ground with a rally car.